Affordable Care Act (ACA) famously known as Obamacare works by mandating everyone to get health insurance or pay a tax. It gives subsidies to the middle-income families and smaller businesses. The law compensates the subsidized amount by a higher tax on high-income families and some healthcare providers. Insurance companies pay doctors for quality of their healthcare instead of the traditional fee-for –service basis. The primary intention of Obamacare is to lower cost of healthcare and provide better healthcare for the whole society. President Barrack Obama signed the Affordable Care Act in 2010 with the aim of protecting consumers from practices by insurances that could increase the cost of patient care or restrict care. So far millions of Americans enjoy the benefits of insurance coverage through ACA, Majority of this lot are unemployed or have low-paying jobs. Others could not work because of family obligation or disability. People who got not get decent health insurance because of pre-existing medical conditions such as chronic diseases were the major beneficiaries. Under Obamacare, people with terminal illnesses can get insurance. The age for parents to add their children to their health insurance increased to 26. As a result, more young people are paying for premiums but do not use the system thus adding the profits to health insurance companies. ACA also subsidized prescriptions for people on Medicare allowing the aged to continue taking their medication and avoid emergency room visits. 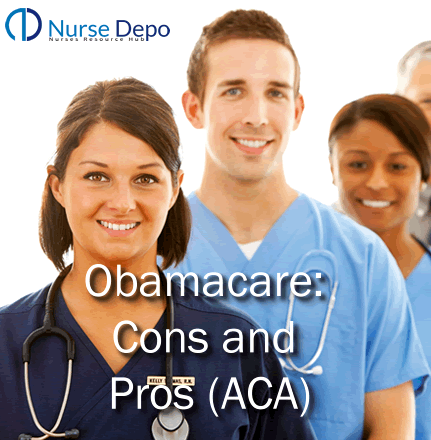 Despite its good intentions, Obamacare has become highly controversial. Conservatives object the higher insurance premiums and tax increase. Some people in healthcare industry also complain about additional costs and workload to medical providers. They think that it might negate the quality of health care. Since its inception, there have been frequent calls for repeal or overhaul of ACA. Over 16 million citizens got health insurance coverage in the first five years of ACA. The majority of the Americans who got insurance are young adults. Anything you want to know about Obamacare Unit? Nursedepo.com brings you original, researched and sieved details to all nurses and nursing students worldwide. Obamacare requires the insurane companies to spend at least 80% of insurance premiums for medical care and improvements. It also aspires to bar insurers from making unreasonable increases in their rates. Insurance coverage is not free, but the people now have more coverage options. ACA dictates that insurance companies cannot deny coverage those for those with existing health condition. Before that, those with a pre-existing condition like cancer found it hard to get a health insurance. Those who were lucky to get coverage were limited to health insurance that did not cover pre-existing conditions. The explanation by insurance companies was that the injury or illness occurred before you took their protection. Under ACA, nobody can be denied coverage because they have pre-existing health problems. After discovering that someone has a pre-existing condition, insurance companies now cannot raise the premiums or drop the person. ACA covers numerous screenings and many preventive services. These two usually have low deductibles or co-pays. The provision was in the hope that the proactive individuals in their health care can delay or avoid major healthcare problems that occur late in life. Obamacare anticipated that healthier consumers lead to lower cost of healthcare over time. For example screening buyers for diabetes and early curing might help to prevent costly treatment if the disease progresses. Some doctors supported coverage for more screenings because it increases the quality of healthcare and reduces cost of healthcare in the coming decades. Before implementation of Obamacare, chronically ill patients ran out of their insurance coverage as insurance companies set their specific limits for expenditure on each consumer. Under the current act, they cannot maintain a limit on the value of coverage they will provide to the customers. Affordable Care Act committed to the affordability of prescription medication. The intention was to lighten the high cost for many people especially senior citizens who could not afford to buy all their medications. The number of drugs, prescription and generic that ACA covers grows each year. Savings on prescription drugs surpassed $15 billion within the five years of signing the act. ACA passes the cost of the above services to Medicaid which in turn passes it to the taxpayer. In the older health insurance plans, some did not offer the benefits for some of the ten benefits. They preferred to charge lower premium costs to compensate for providing fewer benefits. It is a requirement for states to set up insurance exchanges or use Federal Government exchange. Both methods have made it easier to shop for health insurance plans. ACA gives tax credits to the middle class (below 400% of the poverty level) on their premiums. It expands Medicaid to 138% of Federal poverty level providing health insurance for the first time to adults without children. Businesses employing over 50 employees should offer health insurance. It is a benefit to the employees. For their effort, these firms get tax credits to help them with the cost. Obamacare lowers budget deficit in these three ways. If the implementation had progrssed without amendments, ACA would have reduced budget deficit by $143 billion by the year 2022. 10. Eliminates Medicare "doughnut hole"
The doughnut hole is a term referring to the coverage gap in Medicare plans. It means that when you and your Medicare drug plan spend a specific amount of money for the covered drug prescription medicine, all the costs up to a specified limit will come out of your pocket. The focus of insurance industry for many years was on individual coverage until Obamacare came. It shifts the focus on to group plans enabling insurance of households with self-employed workers with better coverage for better rates. For individual plans, the health insurance companies are required to pay at least 20 percent overhead expenses to provide 80 percent of health benefits. For group plans, only 15 percent, overhead costs are used for health benefits of up 85%. Obamacare is not beneficial to the consumers alone. Hospitals are getting the benefit because the uninsured rate is low. The for-profit hospital operators witness a reduction in the number of doubtful provisions or nonpayment of services. The extra profit cost might translate to better care for the patients as it enables hospitals to buy newer equipment and improve their standard of healthcare. The range of advantages by insurance companies is now wider including coverage of individuals suffering from pre-existing conditions. It has led to rising in premiums for many people who had health insurance. Because Obamacare was established to make insurance affordable for everyone, it introduces new taxes for high-income earners and general healthcare industry to cover the cost deficit. Tax deduction on the health insurance expenses increased from 7.5% to 10% for individual’s income which is a huge difference. All these taxes are imposed to get the help of the wealthy in subsidizing insurance cost for the poor. ACA relies on new taxes on pharmaceutical and medical device sales. Medical device manufacturers are taxed by 2.3% of the gross sales while drug companies pay annual fees base on gross sales. Medicare payments also contribute to a funding of Obamacare. Medicare tax for persons earning more than 250,000 for the married individuals and $200,000 for singles increased to 2.45% from 1.9%. It also increased capital gains tax to additional 3.8%. The goal of ACA is for all people to have insurance all year round. You must pay a set fine if uninsured without exception. The penalty keeps on increasing with time. ACA supporters argue that failure to have insurance will pass the cost of healthcare to other people. On the other hand, opposes of the healthcare say that the government was too intrusive to require everyone to be insured. The people without health insurance have to pay tax penalties with IRS. At 2015, the penalty was $325 per or 2% of the income per person annually. By 2016, the cost increase was 2.5% of the income ($695 per person) per year. The amount of tax penalty for a person who still does not have health insurance by 2017 depends on the inflation rate. Anyone who does not want the burden of paying these penalties has no option except to buy health insurance. The ACA site had many technical problems after the launch. It only made it difficult for visitors to enroll leading to delays and lowering the number of expected signups. Despite the fixing of initial problems with accessibility, many consumers still encounter difficulties when signing up for business coverage or family. In fact, many public health agencies and hospitals had to set up programs that guide business owners and other consumers through the setup progress. Businesses with over 50 full-time workers have no choice except to subscribe to Obamacare. The health insurance excludes the first 30 workers, but businesses have to pay a federal fee ($2000) for each full-time employee who is not provided with health care coverage sponsored by the company. To avoid the cost, some business owners increase the part-time workforce causing an adverse effect on employment and living conditions of employees and members of their family. Obamacare opponents claim that it is legislation that destroys jobs. Well, the number of the full-time jobs has in recent years gone up, but still, there are reports that some businesses cut hours from the schedule of their employees. By reducing the worker's hours, businesses can get by the definition of a full-time employee (30 hours per week). You must admit that part-time salary is lower and forcing workers to search for additional jobs to compensate for lost pay at the first employer. The only relive for small businesses that purchase coverage is that they enjoy up to 35% of tax credits. Obamacare is beneficial to companies that feel that the tax credits are enough to cover the overhead expenses. Around 30 million people purchase private health insurance. Insurance companies had to cancel many plans as their policies were not covering ACA 10 essential benefits. The cost of replacement for those who lost their private insurance is high. ACA requires services that some people do not need such as maternity care. About 3-5 million people lost company-sponsored health care plans when their employers turned to Obamacare. Some businesses find it cost-effective to pay the penalty for letting their employees buy insurance plans on exchanges. Other small businesses believe that state-run exchanges provide then with a way to get better plans. Even before implementation of Affordable Care Act, Medicare had an uncertain future, but the beginning of new healthcare law gave it a harder knock. It reduced Medicare reimbursement. According to a Congressional Budget Office, Medicare reimbursement will reduce by $176 billion within the next ten years. The reduction would affect Part A providers such as hospices, nursing homes, and skilled nursing facilities. In additional to sizable payment reduction, access to health care will shrink. The payroll taxes and said Medicare savings that are supposed to increase the solvency of the Part A trust fund would be spent to pay for Obamacare entitlement costs. If it continues in this way, Medicare part A trust fund can become insolvent by 2026. There are some things that things about ACA that government did not inform the people. One of them is a limited eligibility for cancer treatment. Cancer care eligibility ends at 76 years which is the time when healthcare is more important. For the years that Obamacare has been in place, it was still an evolving law. Consumers, insurers and private care physicians (PCPs) were still learning how the law was changing their lives and that of the medical patients. It is a form of experiment that needed more time to test if it works for American interest or not. Covering of people with pre-existing conditions and making everyone to have health insurance are the main provisions in garnering support for ACA. On the other hand, the provision to penalize people without insurance and taxing the wealthy families more are some of the most unpopular components of Obamacare. After the election of President Donald J. Trump who is a critic of ACA, some of the provisions will change. Trump had promised to repeal Obamacare but now plans to retain some of its provisions. He declares it a legislative priority. Days after getting to the office, the President said he would create a plan to replace Obamacare with a law that assures "insurance for everyone." His promise is to dismantle the significant parts of Affordable Care Act, force pharmaceutical companies to negotiate the prices of Medicare and Mediaid directly with the government but still maintain some protections. In the past, Trump said he would like to maintain a provision that compels insurers to offer coverage for people with pre-existing health conditions. He had promised as much to Obama when they met. The significance of other reforms will depend on the changes that new administration makes on Affordable Care Act.